The feeling of spring has long since warmed our backs and we are facing winter with woolly hats and gloves. The art of dressing up to keep warm becomes the one thing that makes the winter possible without feeling the chill eating at your very bones. If the hats and scarves aren’t doing it for you, another great way of staying warm and feeling that cosy deep heat within your belly, is a warm satisfying drink. There’s nothing more delightful then something truly comforting, bringing that feeling of being nourished and warm, and that’s a real hot toddy. A hot toddy is typically something your grandma, or maybe your mother, would have made you when you were sick. It’s bursting with therapeutic herbs, spices and vitamin C. The traditional way to make it is of course with whisky, but I won’t be adding that to this version! 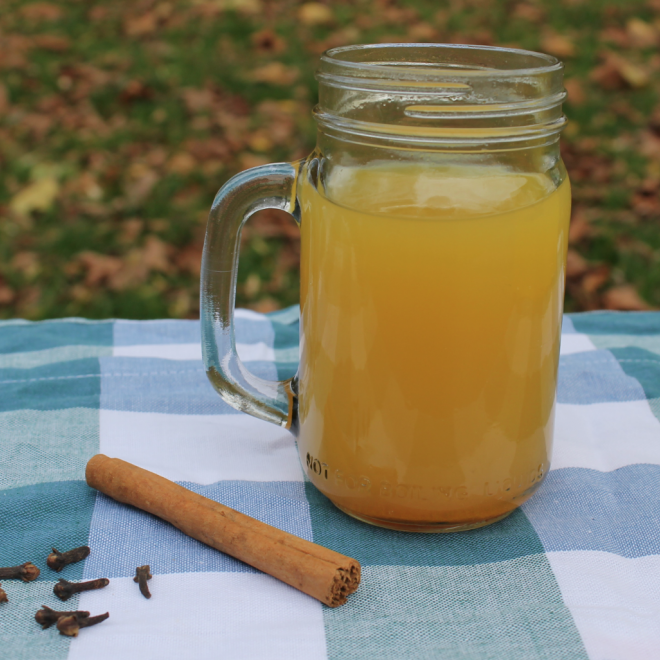 This version of a hot toddy can be used when you’re feeling a bit run down or need a warming drink just before bed. It creates a calming and therapeutically soporific feeling, which is wonderful! Drinking a hot toddy in the bath surrounded by candles can be the ultimate in hedonistic bliss … but if you’re a little on the hot side already I don’t recommend it. This is definitely for those with cold hands, cold feet and for those who need the extra circulation pumping through their veins. In this therapeutic recipe the herbs which are included are great for colds or flu and also digestion. So if you are feeling a bit run down, have a stomach complaint, feel your energy dipping and immune system low, this is a great drink to have. Make more than you need, so you can keep topping your mug up the next day. Cinnamon, cloves and ginger are great for colds as they will promote salivation and secretions will soothe a sore throat and dry cough if you have one. Ginger, helps your digestion and stimulates the circulation. Cinnamon is used in Chinese herbal medicine to invigorate blood flow and has chromium in it which helps balance blood sugar. Cloves warm you up and give you the nurturing feeling. They are also an analgesic, so can stop pain! All these herbs are fabulous for warding off colds and coughs and getting rid of catarrh. And as if you would need any more persuasion, the smell and taste create the nurtured and treasured feeling. A Hot Toddy is typically something your grandma or maybe your mother would have made you when you were sick. It's bursting with therapeutic herbs, spices and vitamin C. The traditional Hot Toddy is of course with whisky, but I won’t be adding that to this VIRGIN version! Put the liquids into a pan, cover with a lid and bring to a simmer over a medium heat. Remove from the heat and let it infuse, with the lid on, for 5 minutes. Strain into a cup or mug and add a squeeze of lemon to add vitamin C.
Add a pinch of turmeric and cayenne pepper if you like it quite spicy.